The Excel Category 6 Unscreened Twisted Pair (UTP) angled Keystone Jack, is an independently verified toolless termination RJ45 socket suitable for mounting patch panels. The angled design of the socket face makes this product ideal for high density frames. Traditional horizontal patch cable management bars can be removed or reduced in number as the leads follow a natural route to the left or right of the panel and the cabinet's vertical management. To the rear of the socket the design is exactly the same as the Excel keystone range, enabling standard termination and cable dressing practices to be followed. The socket itself is housed in a high quality ABS plastic housing, which opens at the rear in a butterfly manner to reveal the IDC termination points. Once the conductors of the cable to be terminated are fed into a wire cap the process is completed by snapping the 'butterfly wings' together with minimal, but firm pressure. 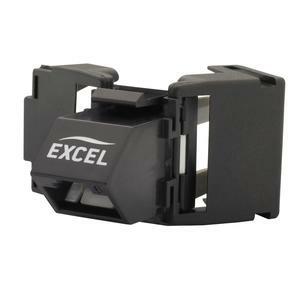 Excel Cat6 UTP Butterfly Style Toolless Angled Jack - Black P/No 100-213.